Finally Found a Saddle that Works for Me! As an avid cyclist averaging 5600 miles annually over the last decade, I had thought that I would never have a comfort level greater than 5 out of 10 on any 50 mile ride. My wife has sworn by the Terry saddle for years but in my ignorance, I thought they only made female saddles. Ive ridden Selle Italia, Specialized, Bontrager, Prologo and Fizik. I settled on the Fizik Arione. Never being fully satisfied, I always hoped I'd find a comfortable saddle. I then saw that WBW had Terry saddles for men. I decided to give it a try. I am so glad I did! It provides by far the most comfortable ride Ive experienced in decades! I plan to install a Terry Fly Carbon on all my bikes. A great looking and reasonably light saddle, the carbon rails give a little cushion to the ride. I ride about 12,000 miles per year and have this saddle on all three of my bikes. I like the looks of the newer all black model with the subtle honeycomb pattern. I didn't think that I'd find a saddle that did it all. After trying so many saddles I thought I'd have to settle on a compromise. I am so happy that I tried this one! It's crazy light, it's comfortable (saddle sores are gone!) and it has the adjustment that I needed to fit me to my bike. To expand on that last item... the carbon rails on this saddle are the longest that I've ever found on ANY saddle out there, going much farther back than any other. This was extremely important to me to get the correct fit on my bike. So now, not only is my bottom happy along with all of the other soft tissue areas, my knees are finally the happiest they've been in a long time. For me, this saddle has brought it all together. I'm in love with my bike once again, even after 100 mile rides and all day on the bike. All of this is after going through all of the test saddles from THREE different bike shops and finding nothing that suited my needs. Needless to say... I am one very happy rider. Great saddle, very comfy and light as a feather. I use this seat on a Cannondale CAAD 1 Fat Bike and you can't even measure any added weight to it. I know the bike isn't that light, but what a difference from the stock seat. I give the seat weight to comfort score of 8.5 out of 10. 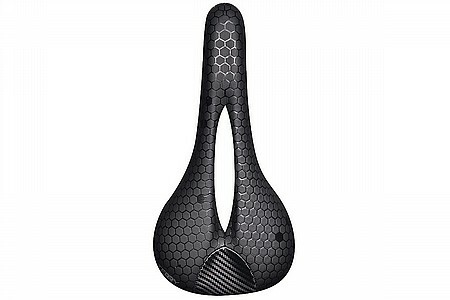 I have had about five of these saddles, carbon and non carbon over the years I dont use them on my light, fast road bikes, but my wife and I ride a tandem, both loaded to tour and unloaded and so it is harder to get out of the saddle as often. I use them on my two touring frames for the same reason. I stay pretty comfortable on these even after 6 hours of grinding with a load. At age 67 my skin breaks down more easily than in my youth so saddle sores become a real potential problem on long tours. This saddle though seems to work best in that regard. I have about 500 miles on this saddle, but most importing I have two long rides with this saddle. One 70 mile ride and one century both rides I had no problems, very comfortable. The saddle is light weight for a comfort saddled just over 200gr and a good price in comparison to Koobi or Cobb bike saddles. Saddle set up and a good bike fit can make a big differences for any saddle but the Terry Men's Fly Carbon Saddle is one of the best saddles I have ridden in the last 30 years.